The SMS Text Messaging feature enables users to receive hold notices via text message. Users can opt-in to this hold notification as their default setting for all holds, or they can receive specific hold notifications via text message. Users can also send call numbers and copy locations via text message. You cannot receive text messages from Evergreen by default. You must enable this feature to receive hold notices and copy information from Evergreen via text message. Click Admin → Local Admin → Library Settings Editor. 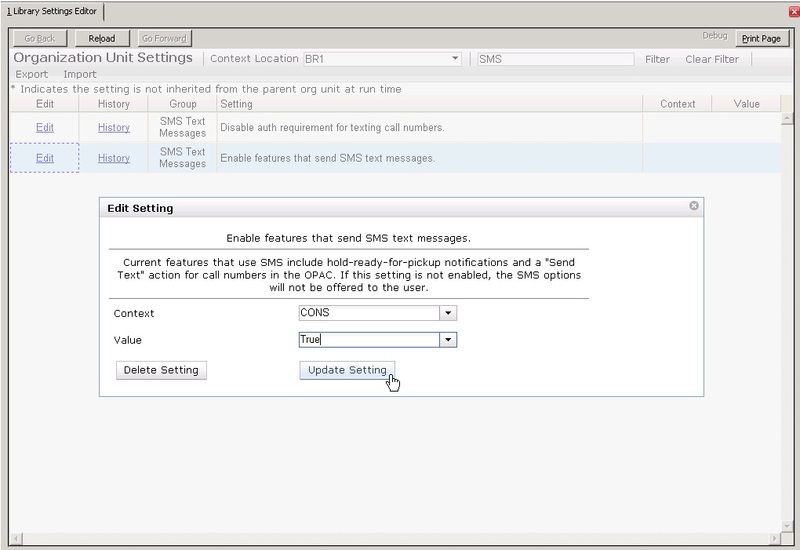 Select the setting, Enable features that send SMS text messages. Set the value to True, and click Update Setting. By default, you must be logged into your OPAC account to send a text message from Evergreen. However, if you disable this setting, you can text message copy information without having to login to your OPAC account. Click Admin → Local Administration → Library Settings Editor. 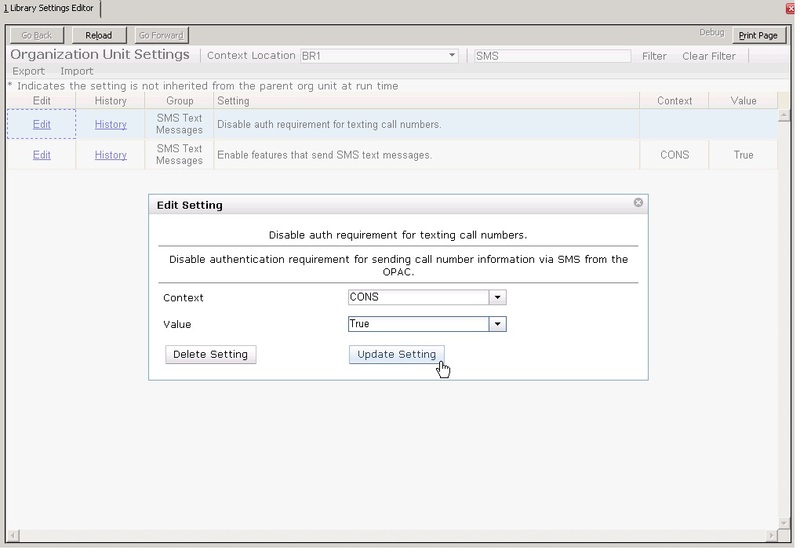 Select the setting, Disable auth requirement for texting call numbers. A list of SMS carriers that can transmit text messages to users is available in the staff client. Library staff can edit this list, or add new carriers. Click Admin → Server Administration → SMS Carriers. To add a new carrier, click the New Carrier button in the top right corner of the screen. To edit an existing carrier, double click in any white space in the carrier’s row. Enter an Email Gateway. The SMS carrier can provide you with the content for this field. 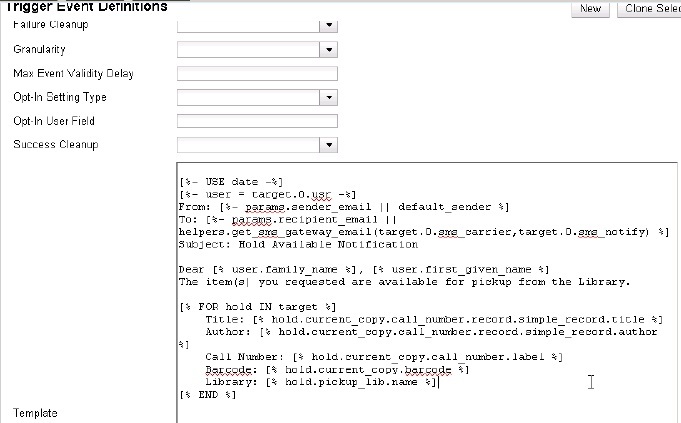 The $number field is converted to the user’s phone number when the text message is generated. Check the Active box to use this SMS Carrier. Library staff control the content and format of text messages through the templates in Notifications/Action Triggers. Patrons cannot add free text to their text messages. 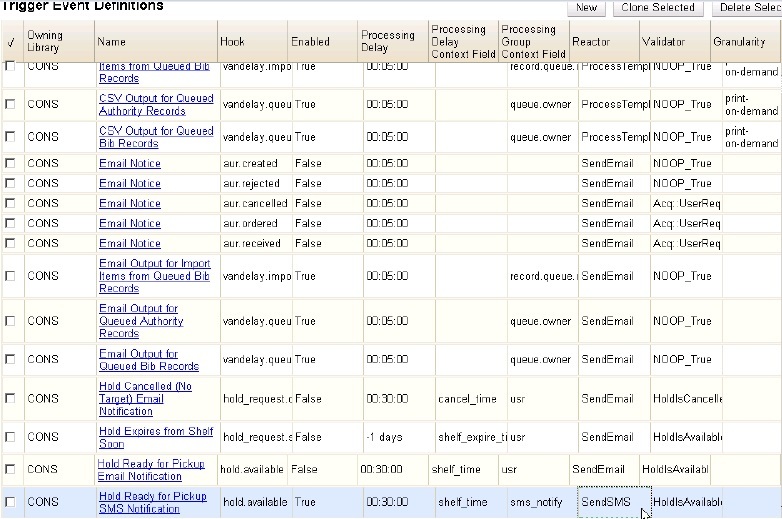 Click Admin → Local Administration → Notifications/Action Triggers. Create a new A/T and template, or use or modify an existing template. For example, a default template, "Hold Ready for Pickup SMS Notification," notifies users that the hold is ready for pickup. You can use the default template, or you can edit the template and add content specific to your library. Click the hyperlinked name to view and/or edit the hold notice.